Posted on Fri, Mar 23, 2012 : 7:40 a.m.
Hailey Clark as Anne Trulove and Kevin Newall as Tom Rakewell in the UM University Opera Theatre's production of "The Rake's Progress." The University of Michigan Opera Theatre presented a delightful production of Igor Stravinsky's "The Rake's Progress" Thursday evening at the Lydia Mendelssohn Theatre. It was a joy to watch the strong cast and orchestra carry the challenging work with such ease and aplomb. Based on 18th-century engravings by English painter William Hogarth, the opera's libretto was written by W.H. Auden and Chester Kallman. Sung in English, it is Stravinsky's only full-length opera. He conducted the premiere at the Teatro la Fenice in Venice in September, 1951. It's the tale of Tom Rakewell, a gullible young man who falls under the influence of a diabolical character known as Nick Shadow. 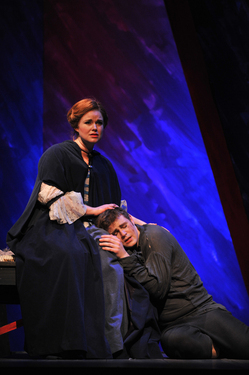 Kevin Newell shone in the role of Tom, with a strong tenor voice that has a gorgeous upper range. He and Hailey Clark, in the role of his betrothed, Anne Trulove, opened the opera with a solid, professional punch that was maintained throughout the production. True to character, the two had a wholesome quality well contrasted with Shadow, played by Isaac Droscha, who combined his lovely voice with a very well acted menacing presence. Droscha really hit his stride when revealing his character's true identity near the end of the opera in a riveting performance. Clark was touching in the role of Anne, with a remarkably consistent, refined yet powerful soprano voice. Sarah Davis made one of the best entrances of the night in a sedan chair as Baba the Turk. Along with her full-bodied voice, she seemed to have fun with the role, and the audience responded enthusiastically. Tenor Alan Nagel commanded the stage in the role of the auctioneer Sellem, putting in a sharply timed, effervescent and excellently paced performance. Benjamin Sieverding combined his interesting bass voice with the requisite gravitas in the role of Father Trulove, his stage presence strengthened by one of the most beautiful costumes of the evening. And Jayme Kelmigian's natural ease on stage graced her portrayal of the brothel keeper Mother Goose, her excessive makeup designed by Erin Kennedy Lunsford serving her well. Stravinsky's score is fascinating, and matched wits well with the masterful libretto. The University Philharmonia Orchestra under the direction of Martin Katz gave a spirited performance, and the chorus was lively and engaging. Especially evocative were the solo harpsichord parts excellently played by Kathryn Tremills. Director Robert Swedberg's production moved at a good clip. Scenic designer Russ Jones' set was enhanced by projections designed by Lisa Buck, which featured colorful takes on the Hogarth etchings. And Christianne Myers' costumes were subtle and rich in detail and historical reference. The University of Michigan School of Music, Theatre & Dance University Opera Theatre's production of Igor Stravinsky's "The Rake's Progress" will continue Friday and Saturday at 8 p.m. and Sunday at 2 p.m. at the Lydia Mendelssohn Theatre, located in the Michigan League at 911 N. University Ave. in Ann Arbor. Thursday's cast performs again on Saturday, and another cast takes the stage on Friday and Sunday. Tickets are $26 and $20 for reserved seating, and $10 for students with ID. They can be purchased by phone at (734) 764-2538 or online at tickets.music.umich.edu. Tickets can also be purchased in person at the League Ticket Office, located in the Michigan League, from 9 a.m. - 5 p.m., Monday through Friday, and 10 a.m. - 1 p.m. on Saturday. The theater is wheelchair accessible, and features an infrared assisted listening system. There will be a post-performance discussion moderated by Swedberg featuring members of the cast after Friday's performance.